September arrives with the gentleness of the March lamb, whose fleece is tinged with shades of orange, scarlet and yellow. This month is shepherded in by a genial sprite whose name is associated with autumn, even though 21 days out of 30, are owned by summer. The dominant green of summer foliage and grass is now the canvas upon which colors begin to appear. The classic autumnal portraiture is prompted by the choreographed movement of the planets which direct changes of light and temperature on earth. 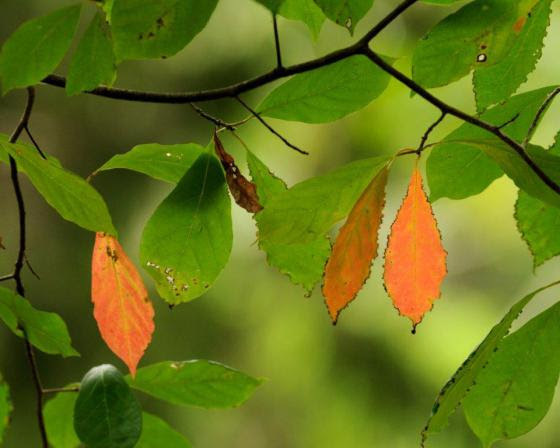 September imperceptibly, at first, applies a touch of persimmon to leaves of the black gum tree, found in moist upland areas of the upper Raritan watershed. That shade of orange stands out boldly against the mass of green. Its elongated leaf, larger at the base, tapering to a rounded tip, suggests a festive light, reminiscent of an old fashioned Christmas tree light bulb. Perhaps using a fine squirrel tail paint brush, and confident from the first strokes of subdued orange, deep scarlet begins to appear on trees as the subtle necklaces of green Virginia creeper vines now glow a brilliant red. The necklace is the first adornment applied, before dressing in the full compliment of matching fall color later in October. Happy with its brush stokes and color selection, September lingers in the red spectrum to color poison ivy at the base of trees to appear as a ground hugging extension of the soon to be, colorful tree tops. 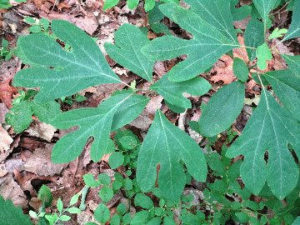 The poison ivy is also used to decorate unsightly stumps and dead limbs close to the ground to clean up the scene with a colorful red and orange cover cloth. Imbued with the freedom of a bohemian artist, buoyed by success, the compound leaves and fruit of the staghorn sumac, is chosen as a progressively bold, next move. The deepest reds are mixed to produce a flat, dark maroon to saturate the trees large, upright velvety seed cones. Another blend of scarlet and bright red is mixed and applied to the long compound leafs which so easily wave in the slightest summer breeze and glow in the low sunlight when covered with early morning dew. Taking a step back to view the perspective of its green canvas scattered with specks of color, September wants to jump ahead and fulfill October’s contract and apply full color to the landscape. The planets and stars, however, have strict rules by which months must abide. Not to be discouraged, September discovered a way to express its soul in full color and still be true to the rules of nature. While temperature, atmosphere and light invisibly impact the color of leaves, their physical nature allows these invisible conductors to be seen in full color in certain conditions. September would paint the atmosphere using temperature and light as its medium to transfer momentary color, making the entire landscape come alive! The daily temperature difference that occurs during the summer to autumn seasonal transition produces heavy morning mists along waterways that is showcased in the arena of open meadows and flood plains. 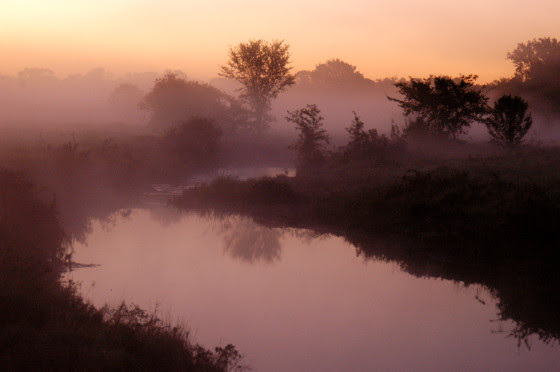 Dawn along the South Branch in September can be very dramatic as the low morning sun shining thru clouds and dust particles produces constantly changing, breathtaking colors in the sky, water and lingering mists. The lighting and colors are so dramatic; the same scene is not recognizable in full daylight. The ability to dabble in orange and red poison ivy and then produce an ever changing orange sky set upon a purple haze is nothing short of pure magic. Actually, it is all science, for the moment, however, magic best describes a September morning. September was restrained from applying more color to static objects during its tenure but found a way to make God movie background scenes using the most brilliant colors of visible light, atmosphere and temperature. 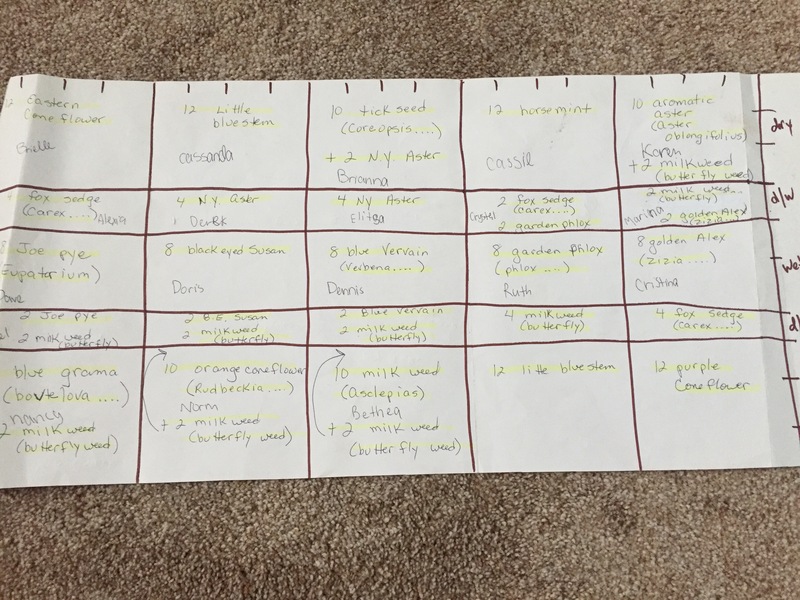 Article and photographs by Brielle Tiger. Brielle Tiger, an 8th grade Girl Scout Cadette, recently installed a pollinator garden in Middlesex County’s Johnson Park as part of her Girl Scout Silver Award. Brielle has been a Girl Scout for seven years. She lives in New Jersey with her parents, brother, two cats and one dog. She loves eating the vegetables from her small family garden. As a Cadette Girl Scout, I have the opportunity to earn the Silver Award, the second highest award in Girl Scouts. To earn this award, the project I choose needs to benefit my community, take at least fifty hours to complete, be sustainable, and be something I care about. For the past several years, our family garden has not had as many vegetables as there used to be even though we had the same number of plants. On the news they show that bee colonies are dying and butterfly populations are decreasing. Could the decrease of these pollinators be affecting the growth in my garden? That is when I came up with the idea of planting a pollinator garden. I decided to start researching pollinator gardens and visited some local gardens to get ideas for this new project. I then contacted the Middlesex County Parks Department. I spoke with Eric and Scott, and they both loved the idea of a pollinator garden in Johnson Park. After meeting several times, we decided to plant the garden in a swale area, just over the bridge from East Jersey Olde Town. This was very new to me, since a swale is very wet soil and the banks are dry soil. 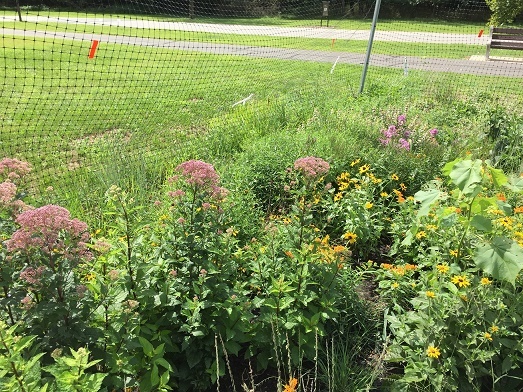 I contacted Michele, who works in the Environmental and Resource Management at Rutgers and Heather with the Lower Raritan Watershed Partnership, for advice on getting plants for a pollinator garden in a swale. They gave me a lot of information on how to plant the garden, how to care for the plants, and what nurseries could provide plants for me. 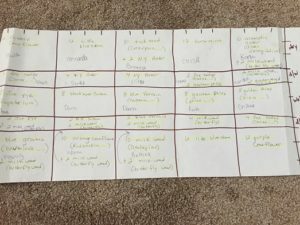 I used the information Michele and Heather gave me to put together a diagram of the garden and contacted some nurseries to see if they would donate plants for my cause. Two of the nurseries, Pinelands Nursery and New Moon Nursery, both in New Jersey, were kind enough to supply enough plants for my entire garden. With my garden being 10ft x 20ft , it was recommended that I plant two hundred plants in my garden to help with weed control. Some of the flowers were Fox Sage, Black Eyed Susan, Orange Coneflower, and New York Aster. Now that I knew what plants will be donated and planted in my garden, I needed to find a deer fence. Johnson Park has many deer, so I wanted to make sure they did not eat my plants. This turned out harder than I thought. I asked several local hardware stores for donations, and none of them responded. So I decided to go online and find places that sold deer fence and were still close to New Jersey. This time when I asked, I asked for a discount on the items needed. Benner’s Garden in Pennsylvania responded and they said that they would give me a discount on the deer fence and donate other needed supplies. Now it’s time to set planting day and find volunteers. Planting day was scheduled on May 22, and many family members, friends, Girl Scouts, and Boy Scouts came out to help. Thirty people came out to help plant my pollinator garden. We had to get the grass and dirt out of the swale, prepare the soil, put up the fence, plant the flowers, water the flowers, and enjoy some hot dogs for lunch! It took almost the whole day to complete, but the garden looked great and it was definitely worth all the work. A few days later, I came back to the garden to put down mulch and pull some weeds. I go back often to water it, and watch how the plants grow in size. I know in the fall, I will have to clean out the garden when all the plants die. In the spring I will have to probably put down more mulch, pull weeds and water again. Hopefully with the plants being close together and being bigger next year, there will be more weed control in my garden. Also, the fact that it is located in a swale, my watering it could be less often, depending on the weather. 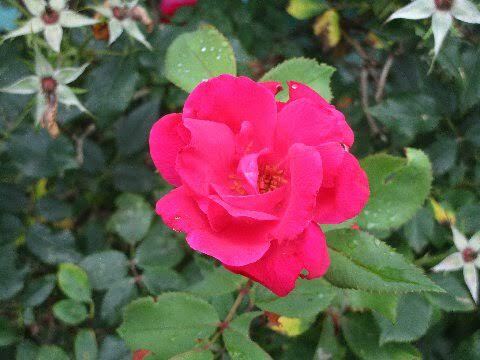 With the flowers blooming, it is awesome to see! I’ve seen a few butterflies and tons of bees, which is a great sight. Doing this was a perfect project and something that other communities should also consider. I would suggest contacting the Middlesex County Parks Department and the Environmental and Resource Management at Rutgers. 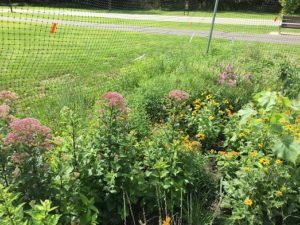 They give great advice on planting native pollinator gardens. At the time that I’m writing this, the tomato plants in my family garden has given us an extremely large amount of tomatoes! Hopefully our other plants will do the same next year because there will be more pollinators. 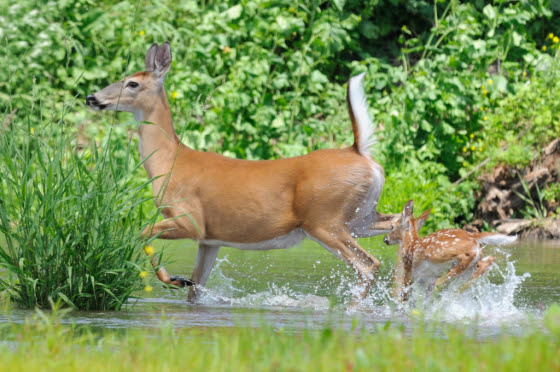 Doe and fawn kick up thie heels in the cool water of the South Branch of the Raritan. The low dam at Red Rock Lake turned the water of the South Branch inside out to create an unbroken white line along its length. Here, the living water falls upon itself in an act of resuscitation, no different from lifesaving CPR. Below the dam, the freshly oxygenated water rushes to fill a deep cut in the river bed funneling its energy, impeded elsewhere by shallows and exposed tree roots. At the start of each trip, below the lake, I do an upstream ferry across the fast water as a tribute to the river’s energy. I provide the proper angle and the river obliges with a free ride across the current with no downstream slip. Angle the bow into the opposing current and the boat spins into a downstream posture to start another river journey through the high summer season. The water’s surface reflected the bright blue summer sky and lush greenery along the shoreline. The river banks falsely declaring a limit to the infinite reach of the sky. August is indeed high summer, all plant life at full maturity vying for sunlight, slender and long, eager to dance in the gentle summer breeze. Lush, light green grass hung over the river bank in one treeless stretch when I saw a painted water snake swimming to the opposite shore. Only the head of the snake, which created a small wake, betrayed its presence. As I neared, the snake slightly altered course. A few feet from the left shore it suddenly rose up, as if struggling. It would have had to press up against something to rise as high as it did and since the water was still quite deep, it begged investigation. 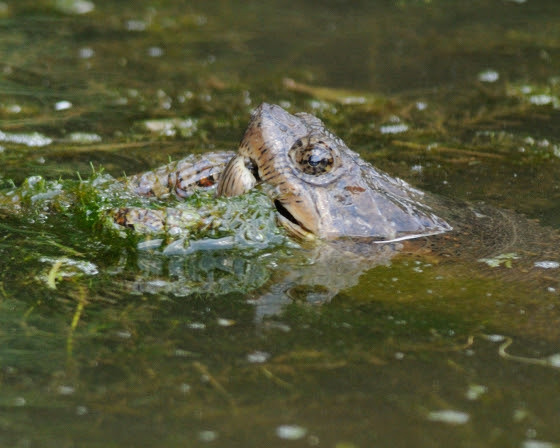 In an instant a snapping turtle’s head broke the surface of the water, draped in dark green grass and holding the snake near the end of its tail end. Such a non vital hold promised a long struggle and struggle the snake did. I began to record images of this fight for life, so inconsistent in such a peaceful setting. The surprise reptilian clash held the colorful snake in close contrast to the turtle’s head. The turtle’s mouth was more of a razor edged compact beak, a creamy tan with fine vertical black lines. The round orb of its bulging eye and dark pupil were the only recognizable shapes against a pattern of dull and dark brown irregular patches that covered the turtle’s head. The black pupil was surrounded by three thick, dark brown streaks radiating out at 3, 6 and 9 o’clock positions, a pattern quite like a style of crosshair seen in some rifle scopes. 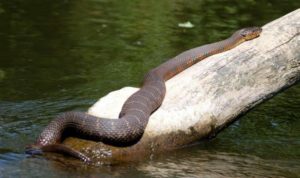 The painted water snake, alias, northern water snake, by its nature, was a linear billboard showcasing a recurring pattern of a variety of shades of tan and orange, and black, the pattern getting tighter and more compact near the tail. The snake must a have just shed, as its colors gleamed to a high shine, enhanced by the water. This is a painted/northern watersnake; the colors are more brilliant just after it sheds its skin. 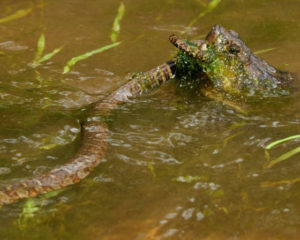 This snake recently dined on some other good sized aquatic critter, now seen as the large bulge in the snake’s stomach. The fight raged on for several minutes, coming to an abrupt end when my boat drifted closer to the combatants. The turtle became intimidated and released the snake, drama over, no evidence of what had just taken place except for some digital images. I imagine the education of both animals was advanced by their encounter. A mile down river the scenery changed as the main current, hugging the up heaved, high, red shale cliff, was slowed by a gravelly shoal stretching across the river. Here, the high cliff disappeared back into the ground to give way to a woodsy landscape. The river narrowed and water became deeper. The tree tops reached across the river to give the impression of a leafy tunnel. This was a straight, short stretch that now opened up to allow the first river view of the Sourland Mountains. An island divided the river here, diverting more water to the right passage around a sharp bend, than to the left. The island had a few small trees smothered in tall sun drenched, light colored grass that reached into the shallow water. Recent events had kept the water level far below normal and as a result, the delicate grass began to grow and prosper where it normally would not. The water level on this day was now raised and flooded the fine green grass. 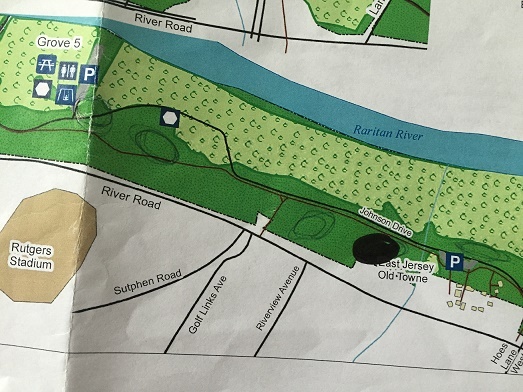 Here, the river bed follows a deep, narrow cut, close to the right shore and obstructed with fallen trees. From the island to the cut, the river was impassably shallow. Coming around sharp bends on an intimate river usually holds the best surprises. Today was not a disappointment as a doe was standing in the water staring at me from 20 feet away. There was little I could do keep still, as the narrow passage along the bank required some quick paddle strokes to avoid being grounded. That mandatory movement caused the doe to run off, seeming more annoyed than frightened. 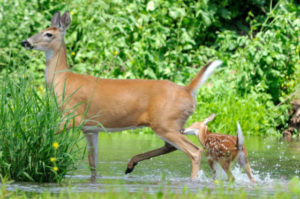 Behind her were two spotted fawns that splashed away through the shallow water and tender grass. 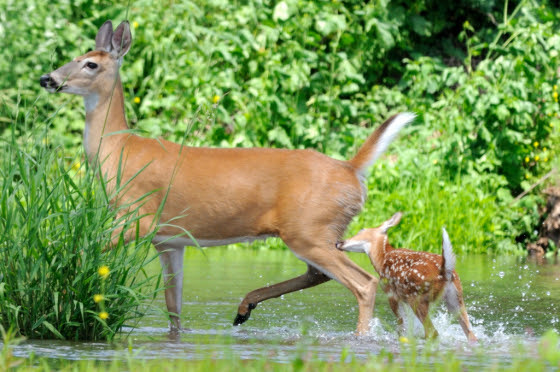 The one fawn ran toward a second doe, keeping close to her heels. Alerted, the doe and fawn ran a few paces and stopped. They really were reluctant to end their mid day romp in the cool river. Water droplets flew in slow motion as the doe and fawn ran off two more times. The light green grass was finely detailed, while the same green scene reflected in the water, lost the detail, but kept the essence of the verdant color to make the foreground and background indistinguishable from each other. The two deer, resplendent in their red summer coats, the fawn, speckled white, complimented the green background. The water exploded from splashing hooves to energize the scene, as it stood in contrast to the reflective water. Raising her pure white tail, the doe provide an exclamation mark to the perfect image to represent high summer on the South Branch. The gardening and yard references are to my house in the section of Monroe between Helmetta and Jamesburg in South Middlesex County. 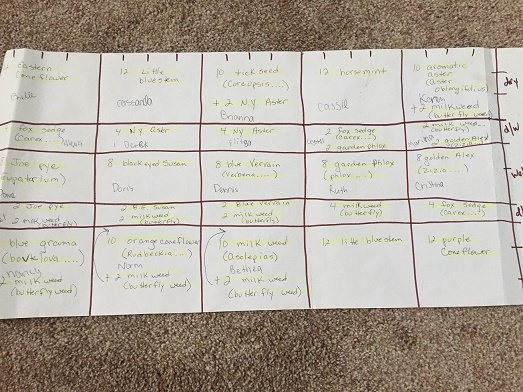 My yard is in a Pine Barrens outlier on the Inner Coastal Plain, the soil is loamy, and my neighborhood is on the boundary of Gardening Zones 6b and 7a. HARVESTING: Cucumbers. Picked a cantaloupe, but I should have waited. So, holding off on picking more cantaloupes. TO HARVEST OR NOT TO HARVEST: My tomatoes are not moving – they are not growing and ripening, plants are dying. I think the wildlife has been getting to them…. 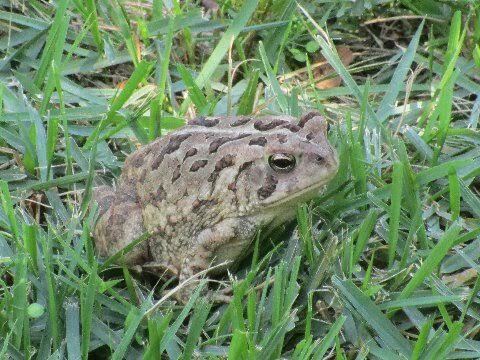 CUTTING THE GRASS IN THE HEAT: I jumped on a sunny, day-off opportunity to cut the lawn – in 95 degrees with a heat index of 114 degrees. I wet my straw hat, stayed hydrated by drinking plenty of water, and took breaks. It was a grind for this old (59) boy. Three wet T-shirts and one fear-of-lightning break later, I finished the backyard. CUTTING DOWN THE GARDEN: I mowed over the area where the lettuce had been planted – and, now, considering planting a late crop of lettuce. I also mowed down for the most part the done-producing corn stalks. ROSE THORN IN MY FOOT: Despite wearing sneakers, I got a rose thorn in the big-toe area of my right foot. Pulled that sucker out fully. Not like the thorn or whatever that I have/had stuck in the ball of my left foot for about three weeks. Just keeping an eye on it, making sure it is not infected, waiting for it to work itself out. MOSQUITOES: NJ has had at least three cases of West Nile virus in humans – one in Camden County, according to the state; two in Monmouth County (Atlantic Highlands and the Spring Lake area), according to the county. I checked a barrel I keep with a combination of rain, gray water, and de-humidifier water and found mosquito larvae in it. So, I emptied some of it and put a top on the barrel of the remainder. Interestingly, I cannot recall one mosquito bite this season. Joe Sapia, 59, has lived his whole life in Monroe. He is, among other things, a Pine Barrens naturalist and a vegetable gardener. He gardens the same backyard plot as did his Italian-American father, Joe Sr., and his Polish maternal grandmother, Annie Poznanski Onda. Both are inspirations for his vegetable gardening. And he draws inspiration on the local Pine Barrens from his mother, Sophie Onda Sapia, who lived her whole life in the local Pines, and his grandmother. coLAB Arts and the Lower Raritan Watershed Partnership are seeking submissions for proposals for new works of found object sculpture using items of trash collected from the Lower Raritan Watershed (The Raritan River and its tributaries). What is the Watershed Sculpture Project? This project is the result of a partnership between coLAB Arts and the Lower Raritan Watershed Partnership (LRWP). Our organizations seek to create awareness of the maturing visual arts scene in the Lower Raritan Watershed as well as the need for community involvement to restore local environmental health. coLAB Arts and LRWP coordinate volunteer clean-ups of area streams and from the refuse collected we identify objects to give to commissioned artists who then create original sculptures for public display. 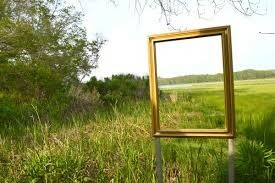 In 2016 The Watershed Sculpture Project will work with the theme of “Frames.” We ask that all proposals incorporate this idea literally in the creation of a sculpture that frames the landscape and can be installed semi permanently along the Raritan River Waterfront at Boyd Park in New Brunswick. 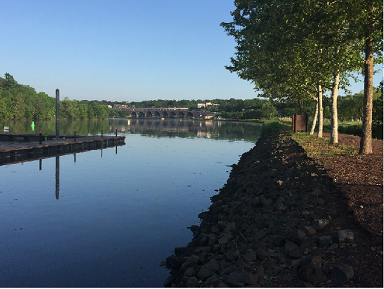 Additionally, we hope the work “frames” a conversation on how viewers can interact in more positive ways with New Jersey’s largest major waterway. Examples of previous year’s materials may be found here: http://www.colab-arts.org/watershedsculptureproject/ Materials sourced have included, plastic bottles, shopping carts, wood, children’s toys, broken ceramics and glass, etc. coLAB Arts and LRWP have stockpiled a small collection of usable materials from previous clean-ups but will also organize a 2016 clean-up toward the end of August 2016 based on interest from selected artists. Because of project goals we ask that artists be cognizant of making their projects entirely or almost entirely of collected clean-up items. In addition, we ask artists to consider not using toxic adhesives or paints. All sculptures will be displayed for two major events one week apart in Boyd Park in New Brunswick. Final sculptures should be constructed to survive in the park semi-permanently during the fall months. All work will then also have a year-long display at our permanent lobby-style gallery space in the Wellness Center Plaza in New Brunswick. With support from the EPA Urban Waters Federal Partnership and from New Jersey’s Watershed Institute, from July 26-28 the LRWP joined dozens of other urban waters communities from around the United States and Puerto Rico for the 2016 Urban Waters National Training Workshop in Washington, DC. The Urban Waters Federal Partnership, now in its 4th year, is an innovative union of 14 federal agencies working to provide integrated support to communities – particularly under-served and economically distressed communities – as they transform their local urban waters into treasured centerpieces for community revitalization. At the Training Workshop communities told stories of how their urban rivers, streams, forests and wetlands are polluted, degraded or inaccessible. But they also highlighted examples of how they are working to measure the relationship between clean, safe and accessible waters environments and improved public health, stronger local economies and lower crime rates. Mayors talked about making clean water a part of every conversation, and about turning to the water to revive civic life. Volunteer water quality monitors talked about the new perspectives gained by “discovering” regional landscapes through their work. And community organizers showed how process is as important as the final product in terms of sustaining the work to clean up our rivers and streams. 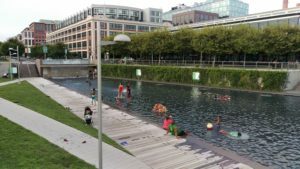 We also had the chance to tour areas like DC’s Anacostia River – a slow-moving diurnal water body dotted with CSOs – to be inspired by how creative landscape design integrates CSO infrastructure, safe river access and play spaces to formerly derelict sites. As groups from around the country shared how deeper connections to our local water bodies can bring community energy that will lead to healthier urban waters, improved public health, strengthened local businesses, and new jobs it became clear that our work in the Lower Raritan Watershed contributes to an important national movement to clean up our urban rivers, streams and watersheds. 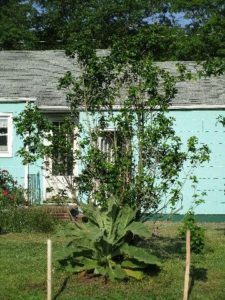 The gardening and yard references are to my house in the section of Monroe between Helmetta and Jamesburg in South Middlesex County. 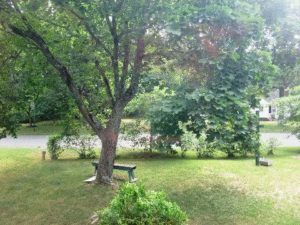 My yard is in a Pine Barrens outlier on the Inner Coastal Plain, the soil is loamy, on the boundary of Gardening Zones 6b and 7a. EARLY MORNING HOURS IN THE GARDEN: On Wednesday, I got up around 5:20 a.m. for an early day at work and had the garden half-watered by 6 a.m. 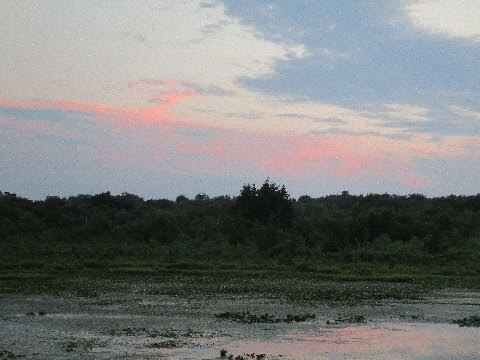 I watched the sky change color, listened to a crow, and watched a great blue heron fly by. Peace! HARVESTING LETTUCE: I dug out 2 heads of lettuce and brought them to work for distribution. Worried the lettuce would start bolting in the heat wave, I was looking to use it up. It turns out there was no need to worry. The lettuce is still producing well, despite the heat. LAST YEAR’S SUNFLOWERS: I had forgot I have last year’s sunflower crop hanging from the ceiling and drying in the garage. Well, I remembered and began spreading the seeds for the birds, squirrels, and any other wildlife that eats them. BEARS ON THE MOVE: Various roaming black bear reports have come in over the last week or so: in South Brunswick and Milltown, for example. Stay clear and all should be OK. 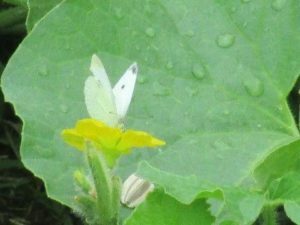 FLOWERS IN THE VEGETABLE GARDEN: Cantaloupes, peas, and cucumbers are flowering, the sweet corn is in tassel, and a white flower is blooming. As for white flower, I am unsure if it is growing on its own, part of the pollinator seeds I threw down, or something else. “KNOCK OUT” ROSES: The “Knock Outs” seem to be doing something different this year — peaking, but retaining blooms, rather than losing all blooms until the next peak. AROUND THE YARD: Stinkhorn mushrooms are popping up. YARDWORK: Saturday’s thunderstorm forecast kept me from my planned trimming of the shrubs and hoeing the vegetable garden. The shrubs can wait, but I really need to attack the garden weeds on Sunday. 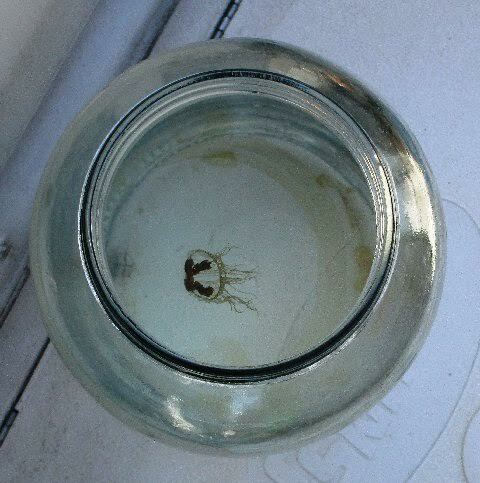 DOWN THE SHORE: The clinging jellyfish, “Gonionemus vertens,” an invasive species indigenous to the Asian Pacific Ocean, has been found in the Shrewsbury River and Manasquan River recently. Their stings are very hurtful and could require hospitalization. They are not expected in Raritan Bay or in the Atlantic Ocean. 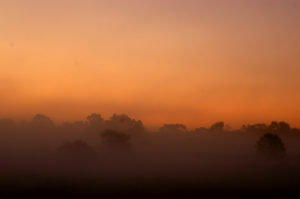 SOMETHING TO WATCH FOR: In the local Pine Barrens, watch for the beginning of the “fall” foliage colors from around July 15 to July 30. Take notice that the Department of Environmental Protection (Department) is rescheduling the public hearing on proposed amendments and new rules in the Flood Hazard Area Control Act (FHACA) Rules, N.J.A.C. 7:13, Coastal Zone Management (CZM) Rules, N.J.A.C. 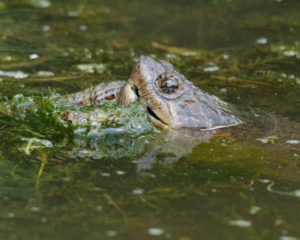 7:7, and Freshwater Wetlands Protection Act Rules, N.J.A.C. 7:7A, PRN 2016-084. The proposed amendments and new rule were published in the New Jersey Register on June 20, 2016 at 48 N.J.R. 1014(a). The Department has rescheduled the hearing date as indicated below. A copy of the notice of proposal is available at http://www.nj.gov/dep/rules and from LexisNexis free public access to the New Jersey Register, www.lexisnexis.com/njoal. Friday, July 22, 2016, at 10:00 A.M. In May, Alison M. Jones, Executive Director of our international partner organization No Water No Life, gave a talk in Tewksbury Twp. on the upstream-downstream issues of the Raritan Basin. Alison writes: “The audience was surprised – and then concerned – about the issues faced in the Lower Raritan and that some of the problems flowed down from the Upper Raritan.” After hearing Alison speak, one member of the audience was inspired to write an article for The Bernardsville News comparing the upstream-downstream disconnect in the Raritan Basin to the problems that led to Flint, Michigan’s drinking water debacle. As in Michigan, in New Jersey we also face a state government willing to accept the public health risks of ignoring – and even compromising – necessary drinking water protections. The Christie administration has put new regulations into effect that will loosen the state’s clean water rules, opening up close to 400,000 acres of sensitive lands to development. While maintaining the integrity of upstream lands is clearly important for communities at higher elevations, the new regulations will have especially dire public health impacts on the state’s historically impaired and poorer downstream areas including the Lower Raritan and Raritan Bay. By opening up upstream lands to development, our downstream areas face compromised drinking water supplies, intensification of flooding, and increased water contamination associated with stormwater flows. Senator Bob Smith, sponsor of Bill SCR66 that would invalidate Christie’s revisions to the Flood Hazard Control Act rules, has successfully pushed his bill through the Assembly and Senate Committees. There is significant support in the Senate for the bill, including from former Governor Tom Kean, the final hurdle is for Senate President Stephen Sweeney to post the bill to a vote in the full Senate today. It is not news to our Lower Raritan communities that water, and all attendant pollution, runs downhill. The daily work in our downstream areas must address the clean-up of not only legacy industrial contamination but also non-point-source pollutants that are carried from upstream. The LRWP has been part of a statewide campaign to support Smith’s bill and to encourage Sweeney to post this bill for a vote in Senate, but successfully addressing historic and ongoing threats to the health of our downstream areas will require new and ongoing forms of regional cooperation. Clean drinking water and the health of our communities is at stake. 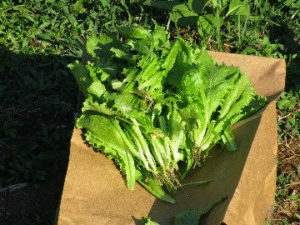 HARVESTING FROM THE GARDEN: I began picking lettuce, harvesting it leaf by leaf, rather than by the head, so the plant keeps producing. (In my haste, I pulled out too much leaf. 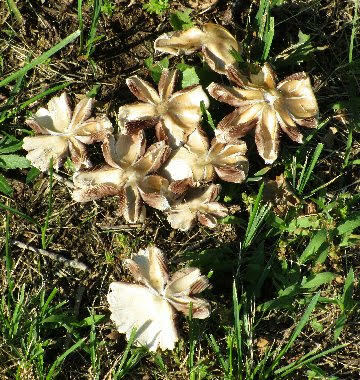 So, next time, will clip them, saving the plant.) Then, I either munch on the leaf right there in the garden or take it inside for a sandwich. 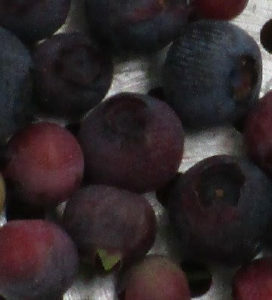 HARVESTING FROM THE LOCAL PINE BARRENS: Blueberries are ripening. I picked some the other day and mixed them into a cup of yogurt. 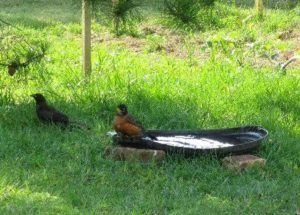 BIRD BATH: I keep a bird bath filled with water at ground level. Birds not only “bathe” in it, but birds and other animals drink from it. WILDLIFE IN THE YARD: The raccoons are still taking advantage of the sunflower kernels in the bird-feeder. And, one evening, I saw a huge skunk passing by. WEEDS IN MY YARD: As I have mentioned, I leave many weeds growing to see what they develop into. Well, I have a huge mullein taking over my American holly in my backyard. In the front yard, I have pokeweed growing. 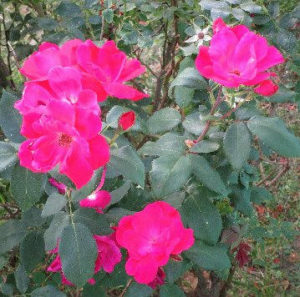 “KNOCK OUT” ROSES: Surprisingly, the first bloom of “Knock Out” roses continues. 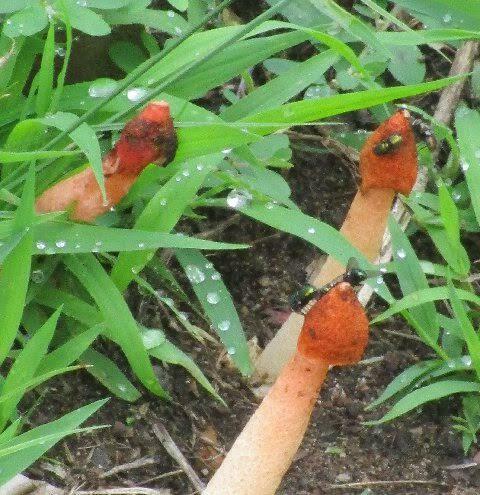 FUNGUS, IN YARD AND WOODS: Fungi growing in my backyard and some in the local Pine Barrens. SASSAFRAS IN THE LOCAL PINE BARRENS: Sassafras trees can have three leaf patterns on the same tree: a two-prong mitt, three-prong, and oval. I found an aberration this week, one with five prongs. Joe Sapia has been a professional journalist since the 1970s. He also is a writing teacher, folk artist, vegetable gardener, Pine Barrens woodsman, Helmetta area historian, and Jeep driver, along with being Marquette University Jesuit-educated..
Born in 1956, Joe is a lifelong resident of Central Jersey, where his family — through his maternal side, the old Polish and Slovak workers of the George W. Helme Snuff Mill in Helmetta — has lived since about 1900. He is a voice of the land and Old Jersey ways.